At this point Andy Warhol’s oft quoted “Everybody will have 15 minutes of fame…” (sic) seems hopelessly outdated, what with YouTube, Twitter, Facebook, Reality Shows and, not least of all, blogs. Warhol would probably point out that there is the small issue of dumbing-down the concept of “Fame”, whatever. I’ve noticed a parallel phenomenon which I’ll call ‘Green Fame’. This is fame with a small footprint, where you take your 15 minutes and instead of hogging it out to 30 minutes and slopping into my 15 minutes, you just copy and paste the same 15 minutes over and over. So here are some random examples I’ve stumbled upon. And sure enough. Back up a few weeks in our blog, and there he is, lending credibility to a graph about Leisure Time from The Economist magazine (above left). I’ve taken the two images and combined them side-by-side so that there’s no mistaking the fact that both pictures must have been taken at the same time. I don’t know if the person who created that graph for the Economist had access to both pictures, but if so, I agree that they picked the better one. If we roll up our sleeves and do a bit of sleuthing in the data that comes along with the picture, it turns out that the image was touched up by someone using Photoshop back in June 2007 from a picture taken on a Canon EOS 20D camera. Whoever did the touch up named it “TV Gut”. Unfortunately the original photographer is not credited in the IPTC data on this copy of the picture. Next is another comparison, that I discovered in a grocery store in the UK a few years ago. Leslie and I were shopping one day; actually she was shopping and I was rolling the cart along behind trying to look like I could make decisions also. 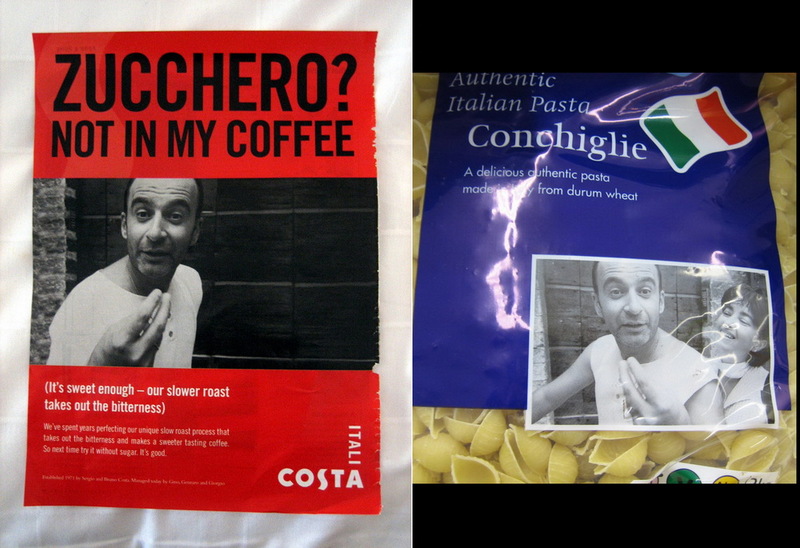 Something about the guy on the Costa Coffee package caught my eye. He was not a Starbucks kinda guy; I mean this fella knows more than French Roast. Made me want to stop what I was doing and go get an espresso. Then a few aisles and a few minutes later I look up and see that Package of Pasta. Hey, wait a minute, this is the Coffee Guy! Since I had my digital camera I took a few photos and then lined them up for comparison…see the difference? Or course not, because there isn’t any; except that the images are flipped left to right and they amputated his left (or right, we’re not sure which is correct) arm in the coffee picture. We try to make each post a Teaching Moment, so what have we learned? You CAN have Green Fame. Green is Good. You WILL be discovered by some nut with not enough to do. Thru the wonders of the net and ‘metadata’ you CAN get Fame credits, just remember to embed your name and phone number in the IPTC fields. Or, you might want to DELETE any personal metadata on all those FLIKR or Facebook photos you’ve uploaded, on the off chance that too much Fame might not be for you. Here’s a how-to on zapping metadata. Now if I could just figure out how to copy and paste the 3 readers of this blog, I might achieve some tiny degree of fame myself. « OMG, I Made Up An Acronym: F2U !